As the Town of Brookhaven expanded and developed "at South" in the 17th through the 19th centuries from its orgins in Setauket on the north shore of Long Island, there was no truly "community" burying ground or cemetery in the region. While the burying ground at the South Haven church to some extent served this role (and apparently to some extent, did the Barteau family site), for the most part families preferred to bury their dead in family plots on their farmsteads. As a result there are over twenty separate old, and historic, burying sites in the two hamlets, containing Revolutionary and Civil War veterans and other prominent citizens of the times. As the time passed, many of the old farms were sold and broken-up, and the families relocated to other regions, although in at least two cases, the family cemeteries continued to be used well into the 20th century. 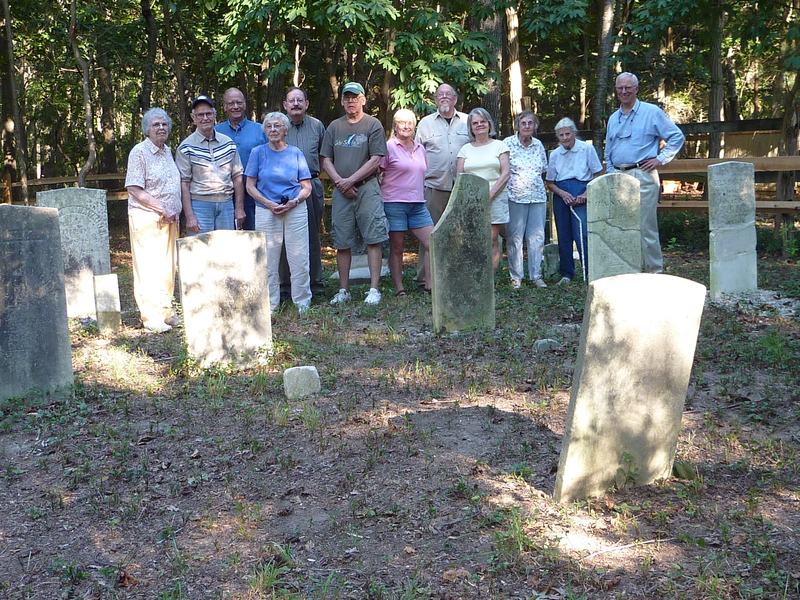 Local residents chose interments in nearby community cemeteries, especially Bellport and Yaphank. In 1890 a local Brookhaven community cemetery—Oaklawn Cemetery—was established. As generations past, the family cemeteries grew into disrepair and abandonment. During the early 20th century, local residents established a strong tradition of providing minimal maintenance for these sites, especially those on or adjacent to their own properties. Newspaper and other accounts also document that the Town of Brookhaven then also accepted their responsibility under New York State law to provide periodic cleanup and maintenance. However, by the late 20th century, it was becoming apparent that the Town was no longer providing the State mandated care, and that the voluntary care provided by local residents was insufficient to sustainably maintain these sites. As a result, a small group of dedicated residents, working under the auspices of Brookhaven Village Association Historian (and activist) Marty Van Lith, initiated efforts to reinvigorate the Town of Brookhaven's maintenance responsibilities. This group became known as the Fire Place History Club. They met with Town elected and administrative officials, researched State laws and County property records, and documented as best they could the condition, location and legal status of all the properties involved. After several years of this work and lobbying Town officials, it became apparent that the Town was not going to voluntarily take action. The Fire Place History Club then decided to take an Article 78 action in State court to force the Town fulfill is responsibilities under State law. With the pro bono help of attorney Regina Seltzer, this suit was filed in July, 2009. In 2008, the Fire Place History Club on their own initiative, renovated one of the more prominent family cemeteries—see Rose cemetery. This cemetery, within a former farm lot, had been badly damaged (mostly by the local farmer). The site was carefully surveyed and documented prior to work commencing. A professional stone mason, Hollis Warner of Riverhead, NY, was hired to evaluate, repair and reset damaged stones. The work was completed using donated community funds, and received considerable community praise. * Since these cemeteries were not in a condition that enabled the stone mason to enter and make his repairs, considerable work was required using volunteer resident labor to make the sites accessible. Since the South Haven Presbyterian Church and Carmans/Miller cemeteries are with the South Haven County Park, the Parks Department provided help in clearing fallen trees and preparing access ways. They also provided materials for fencing. On August 20, 2010, New York State Supreme Court Justice Melvyn Tanenbaum issued a decision in the Fire Place History Clubs lawsuit against the Town of Brookhaven. His decision required the Town to maintain nine of the ten cemeteries in the Club's July 2009 petition. The 10th cemetery—the "Miller Cemetery"—he judged to still be "privately" owned. Specifically he: "ORDERED, ADJUDGED and DECREED that the petition seeking a writ of mandamus is granted. Respondent [the Town of Brookhaven] is directed to provide the assets necessary to comply with the requirements of Town Law Section 291 for such nine cemeteries* within 90 days of service of a copy of this Judgment with notice of entry." * Rose Family Cemetery, David Hawkins Cemetery, Nathaniel Hawkins Cemetery, South Haven Presbyterian Church Cemetery, Carman Family Cemetery, Hulse Cemetery, Corwin Family Cemetery, Azel Hawkins Cemetery, and Barteau Cemetery. While the court made its decision in August 2010, it was not until May, 2011 that the Fire Place History Club saw any indication the Town was going to comply with the judgment, and the club was preparing to file a Contempt of Court citation with Justice Tannebaum. Grave Endeavor: Brookhaven to Care for Forgotten Cemetery. Newsday, May 11, 2011. In June, 2011, work was actually observed to have been completed. Barteau Cemetery, June 30, 2011 cleaned up, except for right-of-way required to do stone repair work. David Hawkins Cemetery, 1 July 2011 cleaned up—and it's not even along a parade route. On Tuesday, September 7, 2010, Dr. Richard Thomas representing the Fire Place History Club, addressed the Town Council of the Town of Brookhaven with the following message concerning the Fire Place History Club's lawsuit over cemetery maintenance. Also present were John Deitz and Marty van Lith. Marty van Lith of the Fire Place History Club reported on July 16, 2009: "It's past the middle of July and most of our historic cemeteries are now again overgrown with vegetation. I feel that we've been patient and tried everything we could do for the past three years to get the Town of Brookhaven to do its duty and maintain these cemeteries. This morning our lawyer, Reggie Seltzer, and I created the legal documents to initiate an article 78 lawsuit against the Town, which Reggie will file with the County Clerk this afternoon (Index No. 09-28006). The actual court hearing may be months away." Article 78 is a provision in New York State Law which, among other things, seeks to determine whether a governmental body or officer failed to perform a duty enjoined upon it by law, and direct a remedy -- in this case, a provision of New York State Town Law section 291 which in relevant part states: "It shall be the duty of the Town Board to remove the grass and weeds from any such [abandoned] cemetery or burial ground in such town at least three times in each year, and to erect and maintain suitable fences around such cemetery or burial ground." The Town has requested and received an adjournment for a hearing to later this fall, and then a second adjournment to January 2010. 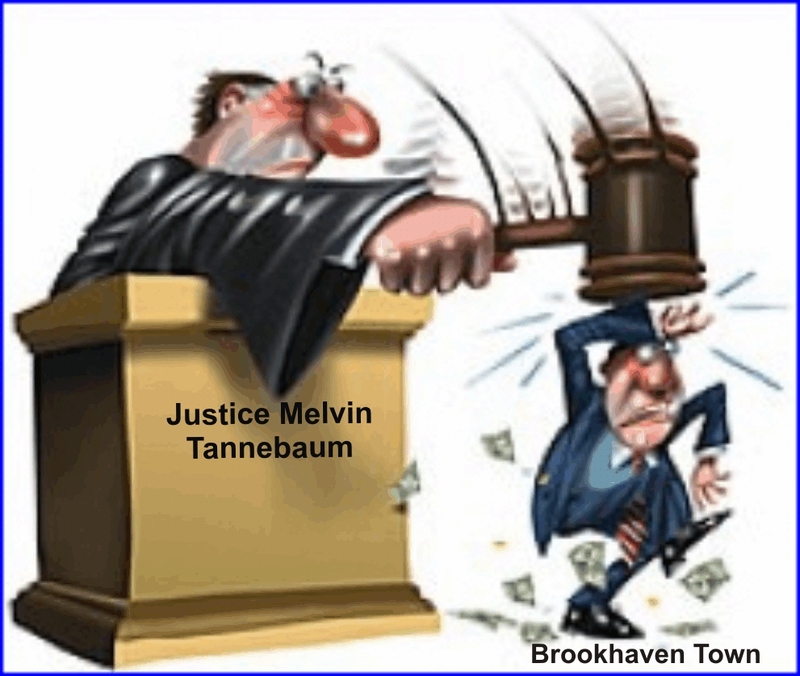 The Brookhaven Town Attorney, on 13 January filed a response to the July court filing—nearly six months after the original filing with the court—obviously an attempt to delay in the hope if discouraging that the reasonable requests of ordinary citizens. Their response was essentially that the Town had no obligation maintain the cemeteries, and the that the Fire Place History Club had no standing to sue the Town. To view the Town of Brookhaven's January 2010 response, click buttons. These are scanned document files and fairly large. I suspect that the Association of Municipal Historians would be appalled that their informative inventory would be used by the Town as one of the justifications for not maintaining historic cemeteries. Immediately on receiving the Town's response, a subcommittee of the Fire Place History Club was formed to prepare the Club's response. Dr. Richard A. Thomas, a retired physicist, took on the task of researching the specific objections in point of law raised by the Town of Brookhaven. He spent several days on this research and prepared a paper for our attorney, Regina Seltzer. After reviewing his research, she decided that it was appropriate to ask for a summary judgment in favor the Fire Place History Club "on the grounds that Brookhaven Town violated its lawful Town duties as explicitly set forth in Cemeteries Town Law Section 291 and that respondents have raised no triable issue of fact a summary determination is appropriate based on the pleadings, papers and admissions ...." She further concluded that the Town's answer, denying knowledge or information as to allegations in our original filing and objections in point of law "are shameful, blatantly false fabrications, without any basis in fact, intended to mislead the Court." The subcommittee—Marty Van Lith, Richard Thomas, and John Deitz then met with Regina Seltzer for over four hours on Sunday afternoon, drafting the reply to the Town's specific objections in point of law. This document was then filed with the Supreme Court of the State of New York at Central Islip on January 25, 2010 (Index No. 09-28006). The Summary Motion and Argument section of this filing is found in the first link (#1). This version, a pdf file, is identical to the court filing except that a few typographical errors have been corrected. Since it is based on the original word processing document, it is considerable smaller than the scanned versions. The Short Summary link, prepared by Richard Thomas, distills the basic arguments into a few paragraphs. At a luncheon meeting of the Fire Place History Club on Tuesday, January 26, 2010, Regina Seltzer discussed the suit with club members. It should be noted, Regina is doing this work pro bono. She is also a former Town of Brookhaven councilwoman. The Town of Brookhaven responded to our 45-point reply to their first response, in which they had denied owning the cemeteries, claiming that they are privately owned and thus the Town is not responsible. They also denied responsibility for maintenance and care of abandoned cemeteries. 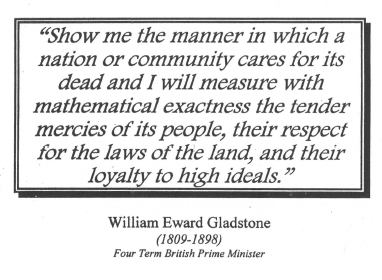 They did not address one single point of the 45 points we made demonstrating that the Town is mandated by NYS law to maintain these cemeteries. Instead, they continued pursuing their contention that these are private cemeteries and none of their business. We answered this second Town response by reiterating our first response and saying that it's irrelevant anyway since the law requires the Town to maintain abandoned cemeteries by "whomsoever owned" in any town. While it was originally thought that the case would be settled by this Tuesday, March 9, it turns out that's the date on which all final paperwork is due in court. The decision will be made whenever Justice Tanebaum gets around to it, which our attorney Reggie Seltzer doesn't think will be anytime soon. So, we are still in limbo and may have to cancel some of the work we have grant money for Hollis to do.